I have to say that this is along the lines of what I think about when people confidently assert the existence of the multiverse, their favorite interpretation of quantum physics, or any other metaphysical assertion. This entry was posted in Zeitgeist and tagged comic, Epistemology, Knowledge, Metaphysics, Multiverse, Philosophy, Science, Web comic, xkcd. Bookmark the permalink. Oh yes, I like that one quite a bit. I feel the same. After this experiment, one can hope squirrel scientists will refine their current hypothesis rather than dogmatically clinging to their current worldview. 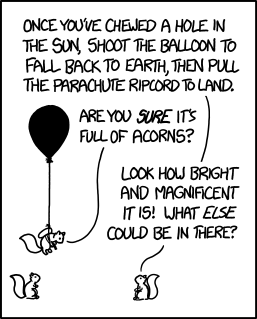 I imagine some of the squirrels would insist that, while the sun was further than supposed, the acorn theory had not been falsified. True enough. Additional research will be required. Is it the same way you feel when people confidently assert there is only one universe? Absolutely. In my view, given the history of cosmological speculation, the farther beyond observations we go, the less cause there is for confidence in any conclusion. The optimal strategy for doing good science is to be cautious and meticulous. However, if one is confident that the multiple universes cannot be proved or disproved within one’s lifetime, it is probably the best rational strategy to be confident in your conclusions. At best, you will be celebrated years later for being right, like Bohr. At worst, you are proved wrong but will be remembered for being a pivotal cog in the motivation for the eventual proof, like Einstein. Sort of a scientist’s dilemma. That’s an insightful observation. It’s always a judgment call for scientists on when to take a confident stand. Be too cautious, and someone else might scoop you. Be too daring, and, ala Fleishmann and Pons, your career could be over. Do it at the right time, if you’re lucky enough to be right, you might look visionary. But politics aside, purely as an epistemic strategy, focusing too soon on a putative conclusion might close our minds off to other possibilities. Hi ‘SAP’, I’m still reading(here and there). Life has been intruding on my leisure time for several months now. It should ease up in another month or so. Thanks for your thoughts on Bellah’s book. I’ll have to read it eventually. It will have to wait its turn though. No surgery(yet at least) on the shoulder – good news! ‘SMBC: Apologies by discipline’ – LOL! ‘RIP, Leonard Nimoy’ – Absolutely! Hi animal. Thanks for stopping by. I totally understand about life intruding. In addition to my shoulder issues, I’ve been pretty busy myself since the new year. The two together has crowded out a lot of my online life. Hopefully things’ll pick up this summer. I both enjoyed and was frustrated by Bellah’s book. He wrote in a style that I found maddening at times, often failing to define key terms (like “mythospeculation”). The number one reason I read him was to get insight about the question of ancient religions and morality, but he only addressed it glancingly, discussing the transition to “global morality” in the Axial Age. But since reading him, I’ve been giving it some thought, and I’m starting to think part of the issue is how someone defines “morality”. Norenzayan is probably taking a broad definition and Boyer and other critics are probably taking a more narrow one. Although I’m still wrestling with it and my thoughts aren’t concrete yet. Anyway, talk with you when you return!